It has over 1700 plugins, each to recognize something different. It can be stealthy and fast, or thorough but slow. WhatWeb supports an aggression level to control the tradeoff between speed and reliability. When you visit a website in your browser, the transaction includes many hints of what web technologies are powering that website. 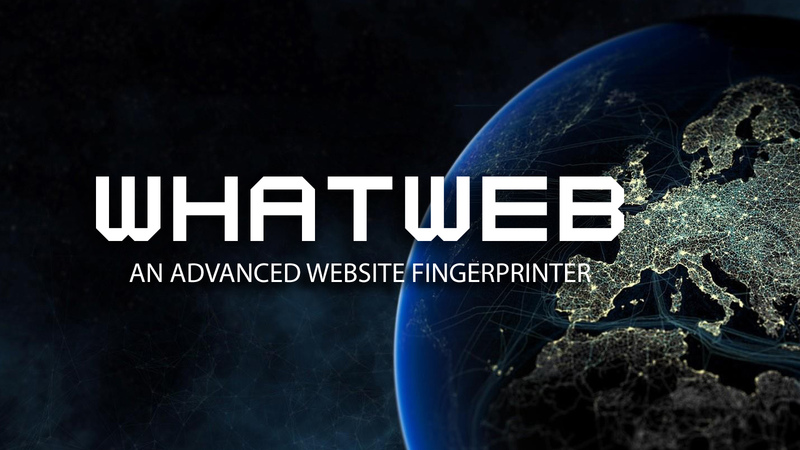 Sometimes a single web page visit contains enough information to identify a website but when it does not, WhatWeb can interrogate the website further. The default level of aggression, called 'stealthy', is the fastest and requires only one HTTP request of a website. This is suitable for scanning public websites. Most WhatWeb plugins are thorough and recognize a range of cues from subtle to obvious. For example, most WordPress websites can be identified by the meta HTML tag, e.g. '', but a minority of WordPress websites remove this identifying tag but this does not thwart WhatWeb. The WordPress WhatWeb plugin has over 15 tests, which include checking the favicon, default installation files, login pages, and checking for "/wp-content/" within relative links. Control the trade-off between speed/stealth and reliability. Multiple log formats: Brief (greppable), Verbose (human readable), XML, JSON, MagicTree, RubyObject, MongoDB. Control over web page redirection. Custom plugins defined on the command line. --url-prefix          Add a prefix to target URLs. --url-suffix          Add a suffix to target URLs. 1. Stealthy   Makes one HTTP request per target. Also follows redirects. --max-redirects=NUM   Maximum number of contiguous redirects. Default: 10. --cookie, -c=COOKIES  Provide cookies, e.g. 'name=value; name2=value2'. --proxy           <hostname[:port]> Set proxy hostname and port. --proxy-user      <username:password> Set proxy user and password. --list-plugins, -l            List all plugins. --info-plugins, -I=[SEARCH]   List all plugins with detailed information. --search-plugins=STRING       Search plugins for a keyword. --dorks=PLUGIN        List Google dorks for the selected plugin. --quiet, -q           Do not display brief logging to STDOUT. --log-brief=FILE        Log brief, one-line output. --log-sql=FILE          Log SQL INSERT statements. --log-sql-create=FILE   Create SQL database tables. --log-magictree=FILE    Log MagicTree XML format. --log-object=FILE       Log Ruby object inspection format. --log-mongo-database    Name of the MongoDB database. --log-mongo-collection  Name of the MongoDB collection. Default: whatweb. --log-mongo-host        MongoDB hostname or IP address. Default: 0.0.0.0. --log-mongo-username    MongoDB username. Default: nil. --log-mongo-password    MongoDB password. Default: nil. --max-threads, -t       Number of simultaneous threads. Default: 25. --open-timeout          Time in seconds. Default: 15. --read-timeout          Time in seconds. Default: 30. --wait=SECONDS          Wait SECONDS between connections. --help, -h              Complete usage help. --debug                 Raise errors in plugins. --version               Display version information. (WhatWeb 0.4.8-dev). You can output to multiple logs simultaneously by specifying multiple command line logging options. Note: All plugins are loaded by default. WhatWeb features several levels of aggression. By default, the aggression level is set to 1 (stealthy) which sends a single HTTP GET request and also follows redirects. Stealthy (level 1) - Makes one HTTP request per target. Also, follows redirects. Aggressive (level 3) - Can make a handful of HTTP requests per target. This triggers aggressive plugins for targets only when those plugins are identified with a level 1 request first. Heavy (level 4) - Makes a lot of HTTP requests per target. Aggressive tests from all plugins are used for all URLs. Level 3 aggressive plugins will guess more URLs and perform actions that are potentially unsuitable without permission. To enable JSON logging, install the json gem. To enable MongoDB logging, install the mongo gem. To enable character set detection and MongoDB logging, install the rchardet gem.